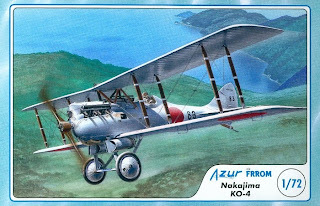 Something of a surprise for early Japanese aviation enthusiasts is a neat model of the Nakajima Ko-4 in 1/72nd scale from Azur/Frrom. The Ko-4 was essentially a licence-built Nieuport NiD-29. I have not been able to find a website for Azur/Frrom but the kit is available here from Hannants in the UK. The majority of the kit is the injection-molded mid grey plastic typical of Czech limited run but there are a number of resin detail parts and a small brass photo-etch fret. The molding of the plastic parts is crisp with fine detail. Printed acetate parts are included for the instrument panel dials and the windscreen. 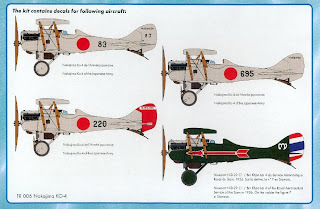 Decals options are for three Japanese Army examples and a single Siamese (Thai) example with a colourful arrow insignia on the fuselage. In addition to service with the Japanese Army and Siam (Thailand) this type was also used by the Kwangsi air force in China and by Manchuria (Fengtien) before becoming a Japanese satellite. The colour call-out for the Japanese Army versions is GSI Creos 311 Grey-Green which is equivalent to FS 36622 (Munsell 7.5 Y 8/1 @ 2.54). Thanks for the notice on this one. Thanks for letting us know. Azur-FFROM seems to have a certain degree of autonomy from Azur. Until now, they released a series of kits of Romanian aircraft or of aircraft somehow related to the history of Romanian military aviation. This kit - and the other two NiD-29 boxings - are a first in the sense that they do not contain ARR decal options. Also seem to conform to the "traditional" choice of subjects followed by Azur.